First announced in June 2018, and released under the tagline “Controller Deluxe”, KeyLab MkII truly lives up to the promise: advanced, yet intuitive features; workflow enhancing shortcuts; dedicated studio controls; thousands upon thousands of world-class synth and keyboard sounds. Arturia’s flagship controller gives the professional music creator exactly what they need, where, and when they need it. • Analog Lab: Arturia’s award-winning software instrument, perfectly integrated with KeyLab MkII, and offering over 6,500 preset sounds from their legendary V Collection series. Browse, tweak, play, and fall in love with the perfectly modelled sound of legendary synths, keyboards, pianos, and organs. • Piano V: a collection of museum-quality pianos brought to life through the wonders of physical modelling. The perfect piano software instrument, create your own personalized instrument and change their characteristics depending on what you need. • Ableton Live Lite: to make sure you’re able to start recording, mixing, and releasing your music straight out of the box, Arturia has included an introduction to one of the most popular DAWs around. Featuring 4 dedicated CV/Gate connections for pitch, gate, and 2 assignable connections, KeyLab MkII gives musicians access to exciting new possibilities with vintage outboard, synths, modular and Eurorack. For the first time, adventurous musicians can fine-tune a sequence in their DAW, including complex automation, and take advanced control over their modular rig. • Category shortcuts to instantly sort your sounds. Looking for a bass sound? Hit the bass button! To aid the early adopters who are keen to make KeyLab MkII part of their music-making setup, Arturia have released a 4-part series of tutorials. Hosted by Andrea, one of Arturia’s product experts, the easy to follow videos focus on the key elements of the controller: its top panel and rear connectivity; its powerful integration with Analog Lab; the power DAW Commands functionality; and customization options. 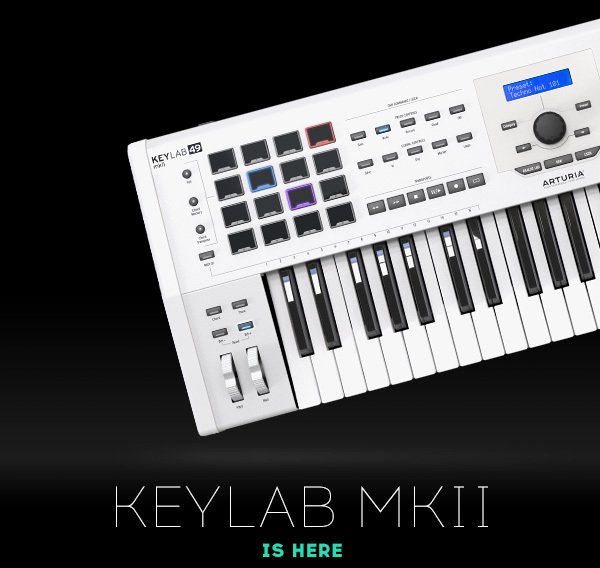 KeyLab MkII is available in both black and white models, and in both 49 and 61-key varieties.